Raised in the Jerrabomberra/Queanbeyan region, Gabbi has lived and worked in the greater Canberra district her entire life. Gabbi attended Jerrabomberra Primary School, and went on to study at Merici College in Braddon. From an early age, Gabbi was a committed sports person, playing Volleyball, Netball, AFL, Oz-Tag, Hockey, Touch Football and Indoor Cricket throughout her school life. She continues her sporting journey, playing Volleyball at the country’s highest level for the Canberra Heat Academy, as well as playing weekly social Oz-Tag. She now also focuses her energy on coaching the younger generation of star volleyball players coming through the ranks, with a close relationship with the Merici College Volleyball Program, University of Dragons Volleyball Club and Volleyball ACT Junior Development Programs. Through her coaching and playing involvement in the sport of Volleyball, Gabbi is a very dedicated team member, working closely with all departments within Estaterealty. Gabbi's competitive nature makes her an incredibly hard worker, not giving up until the job at hand is complete. Working with people and creating meaningful relationships within the business is where Gabbi found her love for the industry. Her friendly demeanor and welcoming smile will always make you feel at ease when visiting the office, or meeting her at an open home. 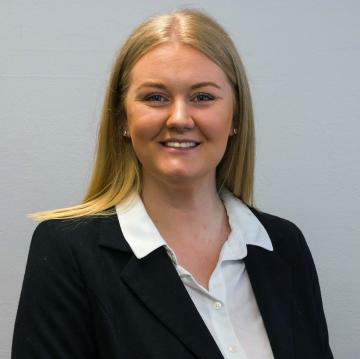 Since commencing her Real Estate Career in February 2018, Gabbi has taken on many roles, and has now found her place in the sales department, where she assists the Principal Ben Stevenson in all of his listings, whilst also listing and selling her own properties. She aims to create an easy and pain-free buying and selling process, where you will be left feeling in control and relaxed when working with Estaterealty. She is committed to making sure all clients’ needs are met, and any issues or enquires you may have, are dealt with effectively and efficiently. Gabbi works in developing the marketing campaigns and strategies for sale properties, and promoting the business, utilizing the many aspects of the ever-changing social media world and classic print media to establish a unique and effective marketing program, only brought to you by the Estaterealty Team. Gabbi is passionate about her role and will always strive to provide the best real estate services from Estaterealty in Queanbyean, Jerrabomberra and ACT for all. Feel free to drop into our office to meet Gabbi. She's always up for a chat and loves to meet new people in and around the area. Plenty of space to call your own. Set over a double block this high set cottage is ready for the growing family, first home buyers or down sizer wanting a great property. Here is a great renovation project, with plenty of living space. There are not many cottages in Captains Flat this big, it is set over two story's and certain to get you taste buds flowing. Live in the property straight away and plan your improvements over time. Located on a double block and only a 35-minute drive into Queanbeyan, you’ll find yourself in the gorgeous 4-bedroom, brick family home at 45 Foxlow Street, Captains Flat. The home and gardens have so much to offer for the growing family, or first home buyer. This stunning property has so much to offer, we can’t wait for you to see it. This property is a rare find in the Captains Flat area. If you are looking to give yourself and your family room to grow in a small country town community, this is the perfect find for you. 45 Foxlow Street, Captains Flat could be your new home. Call Gabbi Kalthofen on 0455 444 560 for your private inspection today. Quietly set among established gardens is this pleasant 2-bedroom cottage with plenty of character and features. This home has the comfortable country feel and will provide a great first home or place to downsize too. Built around the 1950s by the Lake George mining company these cottages are all constructed in hard wood frames, fibrosis and feature timber windows and floors. This particular cottage was one of the main builder’s residence, which you can see as there are extra features throughout. Captains Flat has lovely cottages and this home is no different in fact one of the best. A lovely 2 bedroom cottage with excellent size bedrooms. When you walk through the front door the entrance is spacious and gives quite a formal feeling, and because of its size it has been used as a study nook at times. The Kitchen, Bathroom, and laundry are all modern and in great condition. The cottage itself has had new insulation ceiling and walls, paint, air con, lime washed floors and many more. This beautifully updated 2-bedroom unit, with close proximity to the Queanbeyan city center and a couple of minutes’ walk to Queanbeyan train station, is now available to purchase for an investment property, a first home or a down-sizer. This property is a fantastic opportunity in location and features. For your private inspection, or to find out more, please contact Gabbi Kalthofen from Estaterealty Queanbeyan on 0455 444 560. Set in the heart of the close-knit Jerrabomberra community, with private access to the Arcadia Drive parklands and a two-minute walk to schools and cafes, this tidy two-bedroom townhouse is a perfect buy for an investor, downsizer or a first home buyer. This design of this townhouse blends internal and external living spaces. The open-planned kitchen, living and dining space are bright and airy, with glass sliding doors that access the north facing courtyard. They overlook lovely parkland which is like having a huge back yard. If this properties location and features interest you and you’d like to know more. Please call Ben Stevenson on 0467 046 637 or Gabbi Kalthofen on 0455 444 560 for your private inspection today. Here is a great 1 bedroom unit which has been a good investment for the current owners and now ready to move it on. Perfect for the investor, down sizer or first home buyer. The living area is open plan to the kitchen and has north facing windows. A large bedroom has plenty of room for a double bed and extra space for cupboards and dresser. Directly off the bedroom is the ensuite in good condition but ripe for renovation. There is plenty of potential to renovate and make this property your own. Immaculately refurbished, this property is a special find in the quiet town of Captains Flat. The 3-bedroom fully renovated cottage, has got plenty of charm, whilst being very modern and functional for the first home owner or downsizer. Only a 40-minute drive from Queanbeyan, this treasure is not to be missed. This property has so much to offer, and a unique opportunity for Captains Flat. Don’t miss out on the amazing 167 Foxlow Street, Captains Flat. Call Gabbi Kalthofen today on 0455 444 560 for an inspection, or more information. This well positioned 2 bedroom unit is located in Karabar. Close to shops, schools, gyms and daycare centres it is a great first place to call home or a great little investment. It has 2 good size bedrooms flowing off the open plan dining and lounge area making it perfect for a single person or couple to enjoy this quiet little space. Angus place is a quiet cul-de-sac and home is this beautiful family residence. Complemented by a duel-driveway and double garage with internal access. The entrance features a custom timber doorway which flows directly onto the spotted gum flooring that draws the eye toward the spacious and light filled living areas. To the left and off the entrance hall is the the master suite, with large walk-in-robe, dressing area and very generous ensuite. This north facing, ground level unit is a fantastic property. This property is in a great location; walking distance to the train station, and a short drive from schools, and the Queanbeyan CBD.